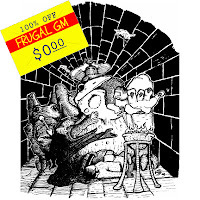 This week's Free GM Resource comes courtesy of Matthew Finch, the big cheese over at Mythmere Games. You know them right? No? What about Frog God Games? Still nothing......maybe a spark of recognition that you just cannot place? OK, you've probably heard of their "big" product: Swords and Wizardry. You can get a some of the Swords and Wizardry rule-books for free, and that is a great free resource in an of itself, but I want to highlight this small, 13 page (347 kb) PDF, titled "Quick Primer for Old School Gaming" that dates back to 2008. I kind of grew up with "Old School" gaming and even though my start is around 1977/1978, I wasn't able to get whole-hog into D&D at that early age so in many ways I'm more a child of 2nd Edition with a bit of 1st Edition education than anything else. I've noticed that most of the players I've had issues with, one way or another, were children of 3.0 and 3.5 Now I'm not attempting to be a grognard or slam another edition, but there were somethings I couldn't get my head around that this PDF helped with. From a GM perspective, I think this PDF could really help give a newer GM some tips and confidence for running a table. Just highlighting some of the differences between old-school play and newer edition FRPG games could really help a GM try to make the game flow smoother and be a bit more fun for all involved. From a player's perspective I think this PDF could help get some folks "head in the game" and challenge the fundamental way some players think about the game. There were also some great directed tips for players. Now I'd like to think I still play and GM in more of an Old-School style, but I know I just think that I do. Sure, I might have my moments.....but like any other skill.....and yes, gaming and having fun can be considered a skill, I need to push myself to become a better player....become a better GM. This free PDF could be a good step in the right direction. 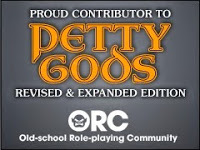 Along the lines of free Swords & Wizardry content, how about the COMPLETE rules free online via www.d20swsrd.com (alternatively, http://www.swordsNwizardry.com)? The cool folks from Frog God Games specifically asked me to create an SRD site (as I had previously done for Pathfinder, see d20pfsrd.com) and I was happy to oblige.